Never at a loss for words as long as a microphone and camera are poised in front of his beak nose, Cluck Schumer recently orated (pompous being the key word) another wing-flapping moment meant only to divide - not unite - America, voters and the general public. If you didn't know it was Cluck, one of the most vile Democrats ever to hold office, one could easily attribute the above statement to a Republican. 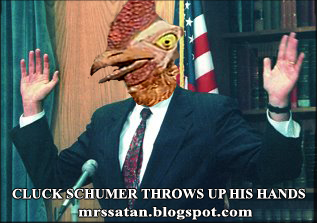 Click HERE and visit Cluck Schumer.